The Corby 25 is a fast sailing racing boat, it is built and designed to sail with great upwind performance. Corby 25s are typically of GRP hull construction, fitted with a fin keel and bulb and a spade rudder. Due to her relative high weight (2t) 50 % in the keel, the Corby 25 is very stiff, holding all sails up to 20–knots true wind, she reaches an apparent upwind angle of about 17 degrees and therefore has an ability to sail higher than most of her competitors. 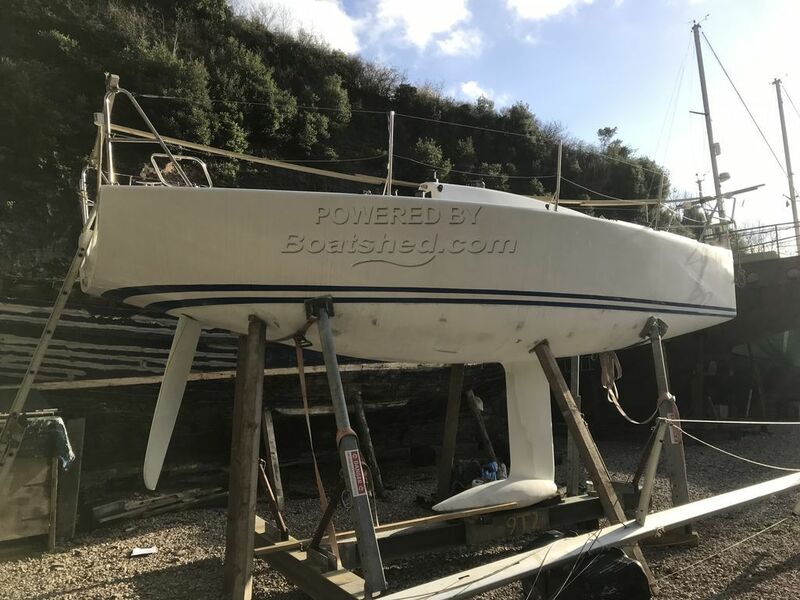 This example is going through a refurbishment and is 90% finished, the owner has bought a new engine and is just waiting for that to be fitted, she'll also have new running rigging, the hull has been polished, once the mast has been stepped she'll be ready to go. This Corby 25 has been personally photographed and viewed by Jerry Harper of Boatshed Dartmouth. Click here for contact details.